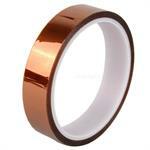 Kapton Tape - high temperature, for thermal printers, heat sealing, insulation, etc. Widths are 20mm, 9mm, 5mm. Priced at10.95, 14.95,19.95 respectively. 100ft per roll.